By BROOKE BOYER- Every year, student teachers observe and adapt to high school surroundings in order to meet their final graduation requirements to learn about teaching firsthand. This excellent opportunity allows IUP student teachers to learn more about being educators and gain skills that will prove invaluable in their later teaching careers. 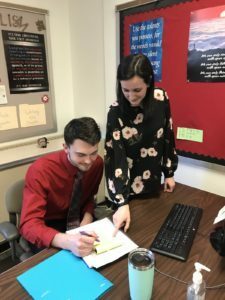 Beginning this semester, several students have come from IUP to teach in IHS classrooms for the remainder of the school year. They will be frequently seen in the hallways and within classrooms, so it’s important to become familiar with and get to know them. Mr. Ryan Caldwell is another student teacher here this semester. He is observing the second and fourth levels of Spanish classes with Mr. Henninger in order to learn more about teaching the language. Being immersed in these Spanish classes, Caldwell is able to learn how to teach a different language effectively. “I’m developing myself as a teacher so that I can succeed in my own classroom,” Caldwell expressed. Mr. Henninger hopes to be a helpful resource for Caldwell this semester. “The biggest thing I hope to offer is my experience through conversation and my example. I hope to be someone that my student teacher can bounce his ideas off of, because that’s what we do as teachers,” Henninger stated. The IUP students will be able to learn from the students and teachers here at IHS, while we will also be able to learn from them. There are still more student teachers this year. Also student teaching here at IHS this semester are Samantha Nichols with Mrs. Lyons in English, Magdalene Sukala with Mrs. McAnulty in Spanish, Jessica McDanel with Mrs. Miller in art, Alexandra Abbatiello with Mrs. Porter in art, Tyler Newcomb with Mrs. Hixson in science, Alyssa Bourne with Mrs. Dress in science, and Kayla Hancock with Mrs. Smith in guidance. Hopefully the high school can be a place of many great experiences for these future educators. Photo Caption: Miss Emily O’Donnell and Mr. Todd Fetsko discuss ideas for their teaching plans. 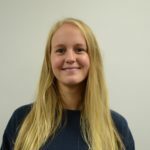 Brooke is a junior and this is her first year as a reporter on The High Arrow staff. She joined journalism in hopes of informing and entertaining peer readers within IHS.